In today’s business climate, owners, executives, and shareholders are decidedly more concerned with security and protection than in the past. Since 2000, cyber-crime has increased over 20 times. While cyber-crime is a significant part of corporate security and protection, physical access to facilities continues to be the number one security breach in most companies. Often, the internet and network security are top notch, but the physical access is simply deplorable. This leads to unauthorized personnel gaining access to information, valuables and other volatile files. Access control systems are where loss prevention and security should begin. 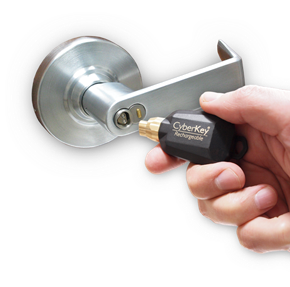 Gone are the days of simple master key systems. Since controlling the access of individuals in and out of various parts of your business is often your first line of defense, a properly implemented access control system provides a vital core layer to safeguarding valuable company assets. While other security elements do a good job of detecting, alerting, and providing information after a security event has taken place, access control systems are meant to satisfy the all-important role of prevention during the security cycle. Because of its preventative ability, businesses are discovering that access control greatly benefits their bottom line. No matter what level of access control your company needs, your system should be tailored to match your unique business objectives. Securing a building in today’s world requires more than locking the outside doors and windows. Most facilities have zones requiring varying degrees of protection, from high security areas such as research labs and server rooms to perimeter gates and frequently accessed supply cabinets. Cost-effective access and key control for all levels of security throughout a facility is a major benefit of an electronic lock system. Additionally, businesses that must comply with TSA, NERC-CIP, EPA, and HIPAA regulations can benefit from the system’s audit reporting of lock and key activity that provides critical information when investigating suspected security breaches. When considering your access control systems, you need to grab your brass keys…. and throw them away. Something feels safe about holding a ring of brass keys. Its heft can give you a sense of control over who can enter your business and where they’re allowed to go. The question is: How can master keys be suitably controlled? Even under the most deliberately managed key control protocol, loopholes exist, such as loaning of keys between personnel; too many and lost and stolen keys; excessive key levels; ineffective return procedures; and lack of personnel to service cylinders and keys. Moreover, there is the cost and time incurred to maintain and change mechanical keys and locks. Electronic access control reduces risk because it eliminates the need to mechanically re-key buildings, saving time and money. An electronic system is easy to change instantly to eliminate vulnerability, and to reduce risk and liability. How many total keys are in circulation? How many different keys are in circulation? Is there 100 percent certainty of unauthorized key usage? If someone loses his or her keys, what controls are in place to ensure workplace safety? Does the key control system consider changes in personnel? With multiple facilities, what is the strategy for the overall organization and for each individual site? Who is responsible for keys in the organization? After you have a complete understanding of the answers to these questions, you should see making the decision for electronic access control much easier.